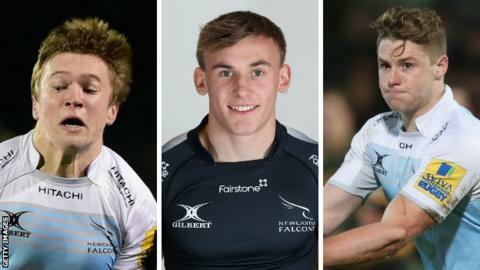 Centre Tom Penny, full-back Brett Connon and wing Dan Marshall have signed new undisclosed contracts with Premiership side Newcastle Falcons. Penny, 21, has made 18 first-team appearances, and scored one try in six league games during the last campaign. Connon, 19, is an Ireland Under-20 international, while Marshall, 18, is an academy graduate. "We have always stated our intention of promoting top local prospects," director of rugby Dean Richards said. "Tom very much typifies that, he is a quality player who has already stepped onto the senior stage and we look forward to having him in our plans for a number of years to come. "We have known for a while here what a talent Brett is, but he has really made his mark now with Ireland Under-20s. "Dan is an attacking threat with pace to burn and great footwork. He is in the best place for his development given the fantastic work of our academy here."